New Orleans, Louisiana – The accredited degree program in General Biology at Xavier University of Louisiana has been ranked as a “Best Value for the Money” in the annual nationwide ranking of U.S. colleges and universities by College Factual. The Biology program at XULA is ranked #4 out of 803 programs at colleges and universities in the United States reviewed as “Best for the Money.” This places XULA’s Biology program in the Top 1% of all such programs in the country reviewed by College Factual for value. XULA improved its ranking position 17 slots over the previous year’s ranking of #21. See the full ranking of Best General Biology Schools for the Money. In addition, XULA’s Biology program ranked #1 out of 14 colleges in Louisiana for value. This makes XULA the best value school in the state for Biology majors. XULA has achieved this ranking 2 years in a row. See the full ranking of Best for the Money Biology programs in Louisiana. Based upon PayScale survey data*, students graduating from XULA with accredited degrees in Biology realize early-career earnings of $36,099 and mid-career earnings of $66,583. Learn more about General Biology as a major. 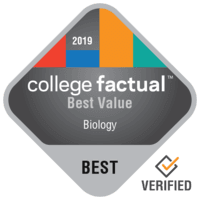 College Factual’s Best Biology Schools for the Money Ranking takes into account the average yearly cost of the school, the average time students take to graduate, and the quality the school provides to students. This means schools who rank highly are offering a good value for the money for Biology graduates. Xavier University of Louisiana is located in New Orleans, Louisiana in what is generally considered a city setting, serving approximately 2,200 graduates. College Factual has estimated the average yearly cost to attend XULA to be $24,885. The average student graduates in about 4.5 years, bringing the average total cost of attending XULA to $111,983. Learn more about value at XULA. Get notified when similar news about Xavier University of Louisiana happens.